Traitor Tree ? The Crooked Elm? The Devil’s Elbow? Are they one and the same? Could a tree used for torture in 1814 be the same tree that died of old age in the 1940s? Back in the 1930s, local writer W.A. 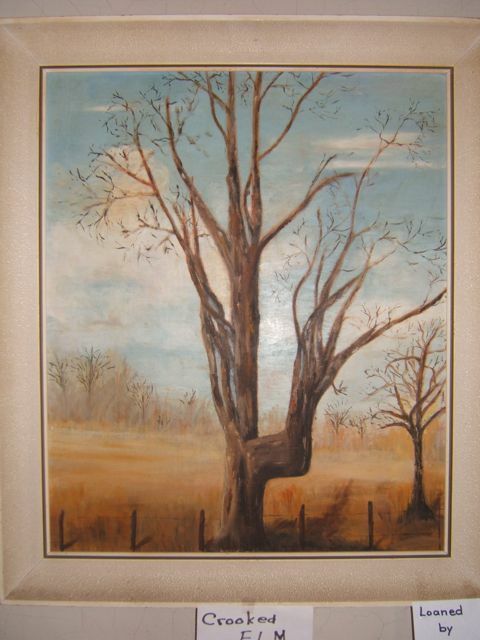 Edwards was curious about the Crooked Elm which was still standing at the corner of Longwoods Road and Tait’s Road . His research produced several old tales but no mention of George Ward being strung up the day before the Battle of the Longwoods. Just a few rods off of Highway No. 2 and well in the “right-of-way” on a side road in the Township of Ekfrid has been standing for generations a crooked and deformed old elm tree, commonly called “The Devil’s Elbow” and supposedly so because the giant trunk, by some freak of nature during its sapling growth, was injured or bent in this grotesque form. But why was it called “The Devil’s Elbow?” I have asked a good many that question and no two answers have been the same. In fact few, if any, of the pioneers still living in the township have the slightest idea how the old tree got its striking name. An old Mr. McRae said one time that he believed the tree derived its name originally from a similar tree near his old home near Glasgow, Scotland. And another story as equally plausible. This man’s name, so the story goes was Israel Devlin. Thus the tree once known as “Devlin’s Elbow” somehow got its name twisted into “The Devil’s Elbow.” That explanation sounds most reasonable of all. But there is another story, legend or lyric, which the writer in his inquiries has dug up and which I am going to try to tell you here. The story runs back to the ferocious feud between the Hurons and their deadly enemies, the Iroquois, or the “Six Nations” who were made up of the tribes of Mohawks, Onedias, Onondagas, Cayugas, Senecas and Tuscaroras. These six nations lived principally South of Lake Ontario in the North of New York State and were noted for their warlike inclinations. They were cruel to the extreme. The “Hurons” were a different type of Indian entirely. They loved peace rather than war. They lived mostly South of Georgian Bay in some 32 villages and instead of war and bloodshed and pillage they, in a fashion tilled the soil, grew “maize” and a sort of barley. Thus they stored away in summer and fall food for the coming winter. They made rude utensils out of baked clay, stone and wood, and altogether, were quite industrious and frugal. It was probably these unique traits that finally spelled the Huron’s doom. Hearing in great detail of the Huron life as lived in the Huron lodges, the Jesuit missions, nearly 300 years ago, or so to be exact, in 1634 A.D., sent three heroic missionaries from Montreal to Christianize the Hurons. We have no space to touch on the labours and sufferings, the privations and discouragements of these gallant soldiers of the cross, only to state that their work was so far a success as to arouse the ire and resentment of the bloodthirsty Iroquois. Although numbering at their best only 3,000 warriors to the Hurons’ 12,000, yet they swooped down on the Huron homes time and again, killing and massacring, until they had all but wiped the great Huron nation away and only a few scattered bands eventually were left, consisting mostly of women and children and old men, who were fleeing hither and thither to join friendly tribes and escape the awful vengeance of the terrible Iroquois. far from what is now known as Tait’s Corners, in the Township of Ekfrid. These Indians (old men, women and children) were hurrying on their way Southward to join the friendly “Neutrals”, who lived along the Thames where it flows through the Southern counties of Western Ontario. Although the long canoes had put many miles between their camp that autumn evening and the death and desolation of their humble homes, yet the little band did not dare to kindle a fire nor disclose in the minutest fashion their presence. So, drawing the four canoes out on the grassy shore they divided amongst them the few mouthfuls of dried fish and parched corn that they still had left, and then tried and tired beyond further endurance they, one by one, forgot their troubles in the unconsciousness of fitful slumber, which was so soon to turn to a sleep that would know no awakening. Not a hundred rods below these refugees, on the opposite side of the river, was “parked” a long war canoe, and on its keel was the war token of the dreadful Senecas. It was a scouting party of these Indians, who were hoping to come upon some remnants of the hapless Hurons. At present these Indians, nine in number, were all sleeping save a solitary sentinel, who once in awhile almost dozed off into a nocturnal nod, then roused himself mightily to toss a few twigs on the fading fire. Suddenly the Indian was wide awake. From upstream somewhere the petulant whimper of a sick “papoose” like the wail of the wind in the willows, disturbed the stillness. The Indian listened intently until a second time the same sound disturbed the silence. Then with the swiftness of magic he flitted from one silent form to another. In but a moment they were all on their feet, awake and alert and as shadows sometimes shape to shade, they had vanished into the forest on their mission of death. It was a long while after, before a hunting party of “Neutrals” returning from the North happened upon all that was left of the fugitive Hurons and their few belongings. The haughty Senecas had refused to take away anything belonging to the lowly despised Hurons. These and a few bones and crushed skulls told plainly the dreadful hate and vengeance of the Iroquois. But it was not until long after that a captive Seneca warrior, suffering torture, told the tale of the midnight massacre in all its horror and gruesomeness. For many years “the elbow” as the Indians called the place on account of the sharp turn in the river there, either in daytime or darkness, was shunned by the people of every Indian tribe and nation. Terrible tales were told about the campfires of the evil spirits that had their dwelling and abiding place at “the elbow” until the biggest evil spirit of all was thought to hover there and so the place at last became known among the Indians as “The Devil’s Elbow” and it was called thus when first the white man came and for many long years after. Such is the old, old legend of “The Devil’s Elbow” as recounted in the diary of one, the late Anna Bell Brown and told to the writer by one of her distant descendants. Posted on January 12, 2012, in War of 1812 and tagged Big Bend, Thames River, W. A. Edwards. Bookmark the permalink. Leave a comment.